As a quilter there are always opportunities to donate what I make, particularly through the charity events run by my quilt guild. This inspires me to share today’s project with you. 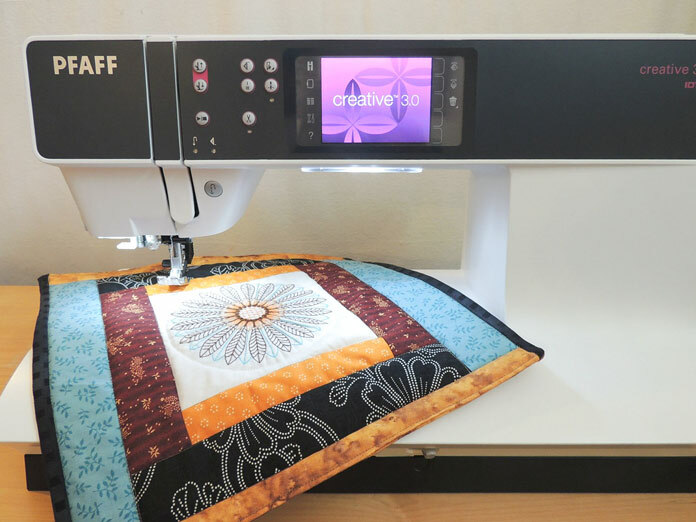 I’m making a small hospice block that features embroidery designs built-in the PFAFF creative 3.0, that are quite extraordinary. This project was inspired by the very first embroidery design I chose from the guide that comes with the creative 3.0. 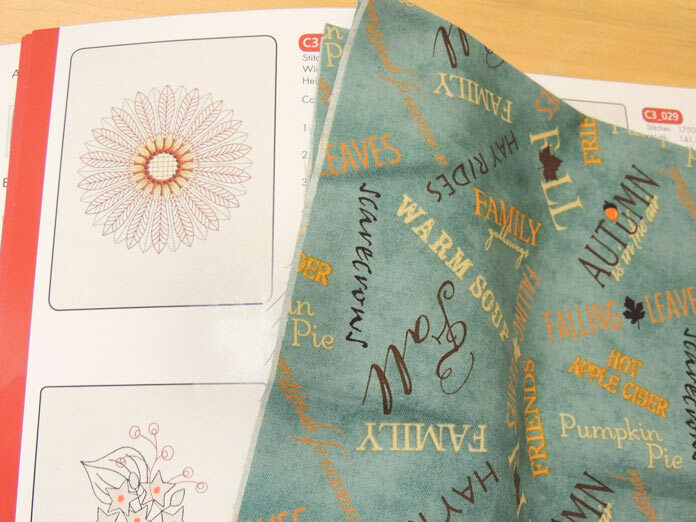 I decided to use some recently purchased fall fabric to choose my thread colors when stitching out the design. Built in embroidery design and inspiration fabric. I trimmed the design to a 6″ square and then stitched out a few more designs that I already featured in previous posts. I was smitten with this design and considered making two to use on a tablerunner. But I really don’t need another fall tablerunner! Then I remembered at my last quilt guild meeting some of the hospice block quilts I’d seen. Guild members are asked to make them for our local hospice where the blocks are hung on a patient’s door and then given to the family. I knew the fall colors would make a lovely gift so I decided to go through my fall stash and find some fabrics to go with the design. 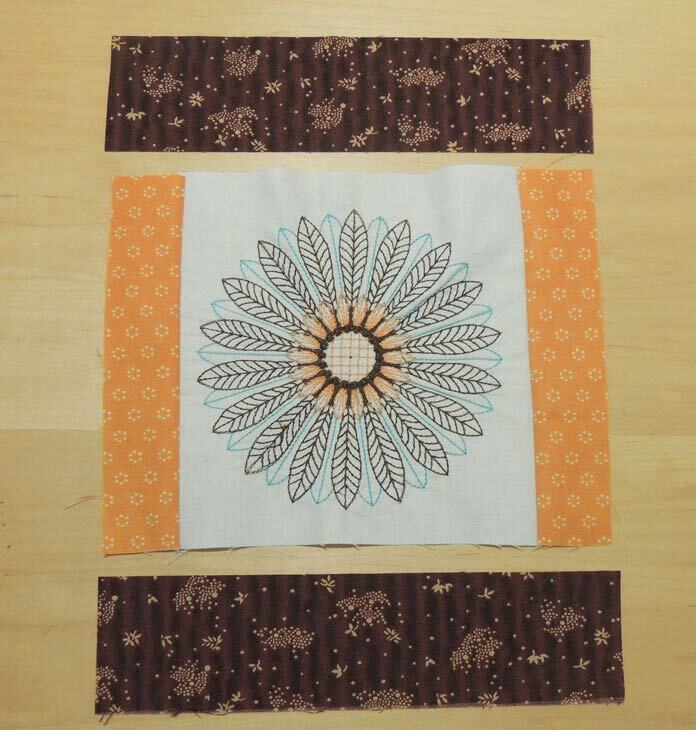 The hospice block quilts are about 12″ square when finished and since my embroidery design itself was already half that size I decided to feature it as the center of a courthouse step block. I simply cut two pieces of the same fabric the same size and sewed them to opposite ends of the embroidery design. Then I repeated the process with another fabric on the other two sides. The only planning I did as to the size of the fabric strips was making sure I had enough of the fabric to make two the same size. If you’d like more of a guide for making your own courthouse step block, here’s a link to a tutorial for making a 12″ courthouse step block. 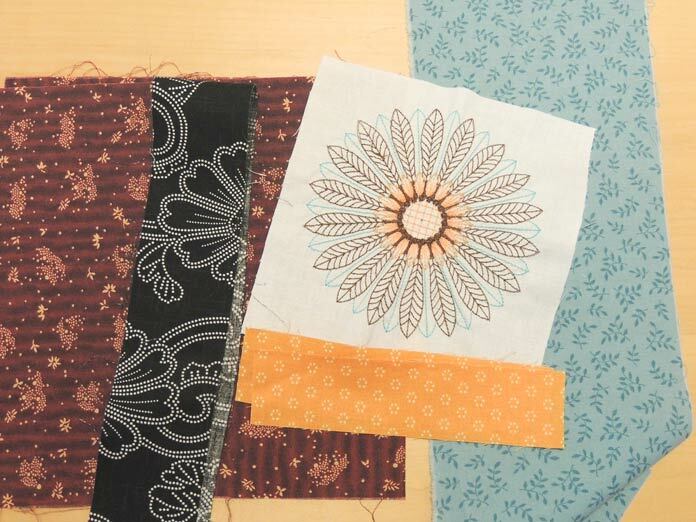 Adding fabrics to create courthouse step block. This donation quilt is quite small, but I think it would be doable to stitch out several embroidery designs and use them between more courthouse step blocks. I liked the fact that I could make something small to give and not sacrifice design details. I would have liked to use my blue fabric closer to the embroidery design to bring out the blue stitches, but I had longer strips of the blue than the other fabrics so I needed to keep it in reserve for the outside strips! To finish the hospice block quilt I used the envelope method again – you can check out that link to my last post for a quick run through of the process. This time I only topstitched on the light tan fabrics and did my other two outside rows of stitches in the ditch of the black outer fabric. Then I quilted in the ditch between all the fabrics including the center square. 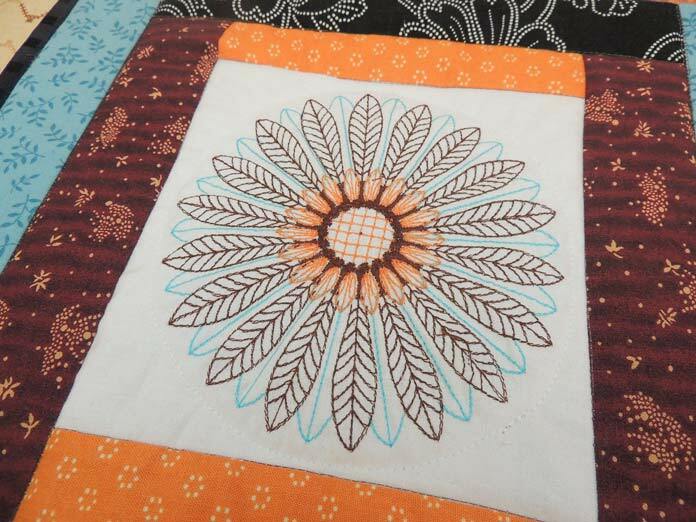 The only additional quilting I did was to change to white quilting thread and quilt a circle around the embroidery design. I was able to use the guide marks on the presser foot to keep my stitches the same distance away from the embroidery all the way around. I think this little bit of extra quilting helps make the embroidery design stand out. I plan to take my completed hospice block quilt to the next guild meeting. I really enjoyed using the built in embroidery design on the creative 3.0 to make a donation project. 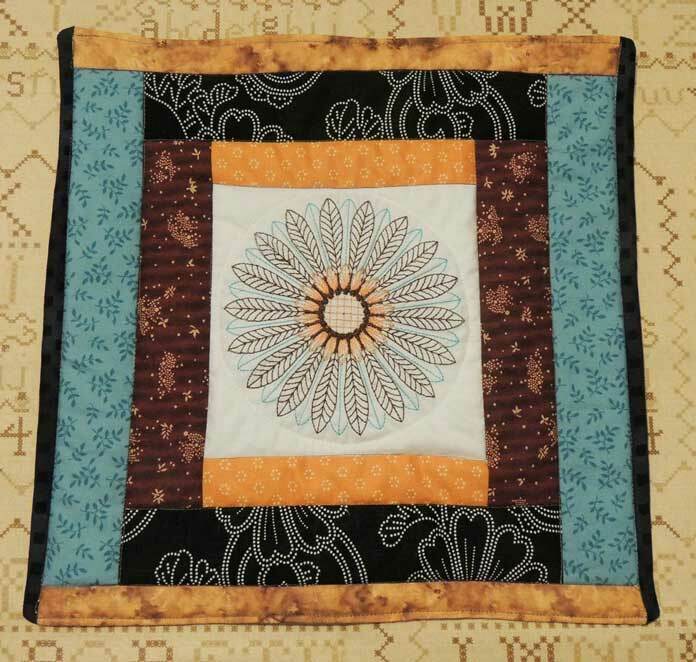 Hospice block quilt on creative 3.0. 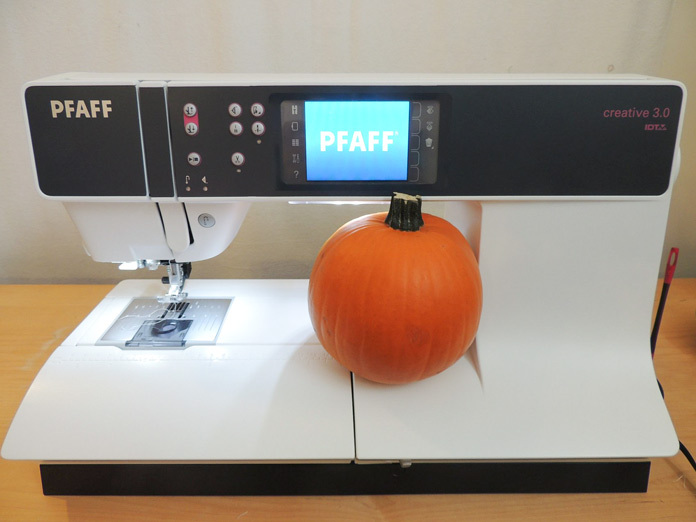 Go to part 5: How PFAFF’s creative 3.0 built-in stitches make a gift bag irresistible!